Belleville customers asked for this boot and now it's here. 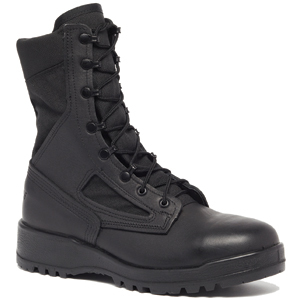 The Belleville 390 TROP Men's Hot Weather Black Military Boot is the soft toe counterpart to the popular 300 TROP ST duty boot. The Belleville 390 TROP boot is constructed of 100% cowhide leather and nylon Cordura. This boot will keep your feet cool and dry with a Coolmax liner, designed to wick moisture away from your feet. A tough Vibram outsole provides excellent traction on the trail and off. This boot is proudly made in the USA. This is my 3rd pair of Bellevilles. I've been to Iraq twice with my last pair and have worn the same pair of boots on both deployments and they. I've taken these on week long rucks and have never had a blister or a hot spot. They do keep your feet fairly cool (for as much as you could reasonably expect when its 120+ degrees. Never had I had the stitching come apart or the soles come unglued. The only reason I just bought another pair is the suede started to look raggedy. Just keep in mind to buy a smaller size because they run big. Buy these! These boots deliver! I bought these for my deployment last year. Just thought I would mention that these were the current issue to the Army for the older ACU which is being replaced with the newer OCP. Anyways, great boots. Held up great for my deployment. 10 mile rucks, 120 degree temps, no problem. Great pair of quality boots for the money. I can't complain. Very comfortable. It's true as advertised when they say "running shoe comfort". These 390 boots do feel like my Asics in padding on the heel and ball of the foot. They are just heavier. One word of caution. These boots are way off in terms of sizing. It boggles me why there is such a disparity in size. I did follow the recommended sizing guideline and luckily I did not have a problem. I dunno why it would make sense for the manufacturer to make the sizing this much off. I'm glad these came in women's sizes. Very comfortable but I had some trouble getting the right size since this is a mans boot. I have these on all day with no fatigue or pain. Wonderful comfort with very little break in time. Hands down the most comfortable pair of boots I've ever worn over my 15 year career in the Army. There's enough flex and give to do whatever you need without feeling like you have 2x4's strapped to your feet. But one thing I need to mention is these boots do run big. I thought I would order my normal size but these run at least a half to a full size up. Other than that, these are awesome boots. I'm not in the military and I bought these do some traveling and I wanted a dependable pair of boots that I could take backpacking, wearing 12+ hrs/day. I asked a buddy who has a few tours in the military under his belt. He recommended these and told me to soak them in water and wear em for a day to break them in. I added a set of Superfeet Green inserts and these have been a great purchase. I bought these Belleville 390 boots a year ago from these guys. I'm in construction and I wear them 10 to 12 hours, everyday. I wear 12 in regular shoes and that was a 11 in these. Durability is great, comfort is great, they are holding up fantastic even after a year. Mine have gotten wet a few times. They dried up fine. The only thing is the suede eventually does get darker but probably due to dirt. Overall great boots. I'm very happy I bought these. Tough, reliable, comfortable, and made in America. What more can you ask for. I've been wearing Bellevilles for 4 years now and this is my third pair. I'm hard on my gear and usually go through boots within 6months. Not these. These are built to take a beating! These belleville hot weather boots run really big. I wear my boots big but i ended up getting a whole size smaller than my running shoe size. Great boots though. I bought 2 pairs of these for my deployment to Iraq. These have saved my feet with over 120 degrees+ of heat at the peak of the day. Awesome boots and I just put them on and went on a ruck march with no problems at all. I'm on my feet all day with my job as a construction surveyer. Lately, an old ankle injury has been bothering me so it makes it hard to stand all day. I bought these Belleviews based on a friends recommendation who is in the Army and says he has bought this brand for years. I just want to say that he was right and these boots took the pain away. I'm not sure how it works but I can get through most of my duty shift pain free. Maybe it was time for a new pair anyway but I really cant complain. They work! This is my 5th pair of the these boots. I started out wearing Bates but the Bellevilles defintely beat them out comfort wise. These boots got me through SFAS, SOS, RSLC, Ranger Training, and some tactical courses before they gave out. My boots got here fast and they were in good condition. Stick to the sizing guidelines for these boots and your feet will love them. They do run extremely large like the manufacturer says. After that, these were pretty darn comfortable. I'm serious when I say they feel like my atletic shoes (Nikes), and the workmanship seems are very good. Very slip proof soles that give me traction on everything from wet sidewalks to mossy rocks. I recommend them highly. Just make sure you order one size smaller than you normally wear. Despite this, I still put in green Superfeet insoles and they are perfect. I order this boot for the Panama jungle camping, my good experience with the boots over 6 month. Very good quality for this boot. I am very good with the desert boot and with the company. VIVA PANAMA!. I bought these on the recommendation of a friend. My requirement was for a comfortable pair of walking boots to wear for travelling in Europe. So I asked my buddy who has been in the army and to Afghanistan twice and he says to get these. One of the things he recommended that would help me break them in is to hose them down and then wear them wet for a day. So I did that, let them air dry out, and then replaced the factory insoles with Superfeet. After that, it was like wow! These are the most comfortable boots I have ever worn and maybe even as comfortable as my running shoes. Before this, I tried on a pair of Timberlands and there was no flex in the arch of the boot. It felt like I strapped a couple of wooden planks to my feet. Great boots but just keep in mind that they do run big so order 1/2 size or even a full size larger than you normally take. Other than that, I'm really happy I bought these and they served me well on my trip with no problems at all. I've owned Belleville boots in the past and the 390s needed more breaking in than my older pair. It took me about a week before they got comfortable and they made my feet hurt. I had to loosen up these boots a couple times by letting out the laces but I like to wear my laces tight on my boots. The boots were great after they were broke in. Let me first start by saying that this is the third pair of these exact boots that I have owned. They have all been this style and all the same size. However, something was different this time. As soon as I opened the box, I noticed that they seemed huge. Second, I saw pitting and small holes in the soles and small black splotches on the cowhide. Not the quality I have come to expect from Belleville. Back to the sizing: after taking them out and moving my orthotics over from my other boots(READ: Same exact model, style, and size) I realized that there was about 3/4-1" space between the tip of my orthotics and the front of the boot. Somehow the boots have grown. I'm not sure if I missed a memo or something, but I'm really disappointed with what I recieved. The worst part is that I waited too long to purchase new boots so I couldn't return them as I needed a nice pair for a few days later. Any returns would have left me without decent looking boots. Like I said, that was my fault. So now I have a pair of boots that I don't think I'll get the field wear out of because I don't think they'll form to my foot like the others did. I guess I'll get another brand to start breaking in to use for field/ruck purposes and use these things for classroom/non-movement purposes. This will probably be the last pair of these I'll buy. I'm going to write Belleville and see if they have anything to say. The best boots by far that i have ever owned. my buddy got a pair of oakley SF boots the same time i got mine. we both wear them everyday and his are falling apart like a cheap sneaker....! I got my first pair of these boots at West Point and was immediately impressed with how much better they were than the old standard issue black boots. The Vibram sole wears well and provides excellent traction in a variety of surfaces. Unlike some of the other boots, the Belleville 390 DES do not seem to require a break-in period. I had to put on a new pair during Sapper School and immediately wore them for dozens of miles carrying up to a hundred pounds of gear, and I couldn't really tell much of a different between them and my old ones. For rucking, running, or general every day use, these boots have served their purpose in combat, training, and everything else. I can't recommend these boots highly enough. Local boot shops will replace the soles when they wear out. These are the current standard issue boots for most U.S. forces, and for good reason. The Belleville 390 DES boot is comfortable from the first wearing, lightweight and remains comfortable during extended wear. I had not worn boots regularly since my last flying assignment in the US Navy in 1993, and wasn't sure how I'd adapt to these boots. The good news: no adaptation was needed. I was expecting a break-in period as I'd experienced with previous "issue" boots..and none was required. I've since worn them for up to 12 hours daily with socks of varying thickness and material: no issues with rubbing, blisters or binding across a range of surfaces (woodland, grass, sand and pavement). Two notes: (1) These boots are not waterproof, so if you anticipate a wet environment or rain, you'll want to treat them with water repellent. (2) Start sizing these boots a full size smaller than what you normally wear. Normally a size 11, choosing a 390 DES in a size 10 yielded a perfect fit. Belleville 390 desert boots are excellent boots. Well made, very light, sturdy, good traction, good ankle support, and excellent shock absorbing soles. They are more comfortable than running shoes, but support as well as any other boot I've worn, and cushion better than they support. Since I started wearing these, my knees and back have been hurting a lot less than they had. No other boot ever fit as well out of the box, and these are lasting very well. I can't recommend these highly enough. Best Combat Boot there is! I have been in the Army awhile now, and I have tried many boots. The problem that I was having was that my feet would end up hurting over time, or they would just feel worn out. After I tried this boot all my problems vanished. These boots are very comfortable, in fact, they were better than my running shoes, and they are an enjoy to wear. The only down side to these boots is that they are not waterproof, but because of how comfortable and light these boots are I feel that they are very deserving of a five-star rating. After a year and a half of wearing these everyday I finally had to buy another pair as my old ones were worn out.